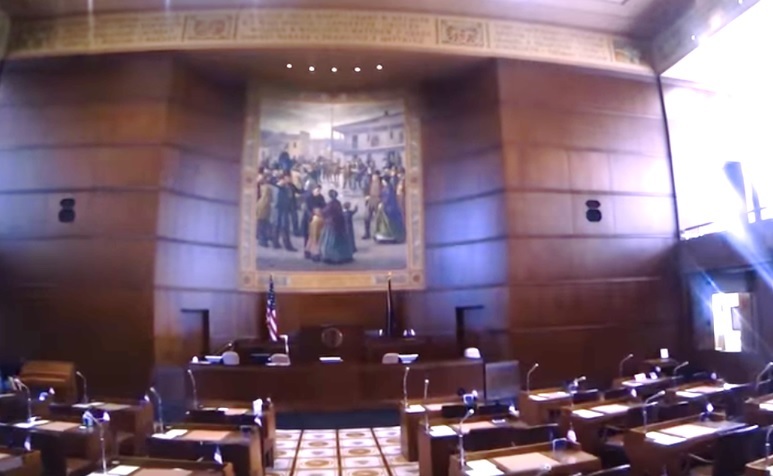 The 2018 Oregon Legislature recently concluded their short legislative session. The session lasted approximately one month. For Oregonians In Action, the session was quiet, but nevertheless productive. Although land use bills were not prominent in this year’s short session, OIA managed to get two changes in the short session. House Bill 4031 allows guest ranches to be sited in central and eastern Oregon. Guest ranches, also known as dude ranches, offer tourists the chance to experience life on a working cattle ranch. The guest ranch operates as part of the main ranching operation, and guests stay at the ranch and participate in a variety of outdoor activities, from horseback riding and hiking to actual ranching operations. The ranch gives tourists the chance to experience life as it was in the Old West, with the exception of having great meals and comfortable accommodations. Until 1997, guest ranches were outlawed in Oregon, as ranches operate in farm zones and guest ranches were prohibited in farm zones. However, OIA worked with the legislature in 1997 to establish Oregon’s first guest ranch law, and the law has been changed a number of times in the intervening years as guest ranches became a popular destination for tourists on the other side of the Cascades. Unfortunately, the last guest ranch law had a sunset date of January 1, 2018, and the legislature failed to extend that sunset date. So as of January 1, 2018, guest ranches were again a prohibited use in farm zones across the state. OIA received a phone call late in 2017 from a guest ranch owner asking to extend the sunset, and in turn, we asked State Representative Brian Clem, chairman of the House Agriculture and Natural Resources Committee, to renew the law. Since the law had already sunsetted by the time the legislature reconvened in February, the legislature had to re-create the entire law and pass it all over again. OIA was able to convince Rep. Clem and his committee to re-pass the law, and extend the sunset to April 15, 2020. The bill was approved by both the House and Senate Committees, was approved by both the House and Senate, and was signed by Governor Brown in mid-March. OIA will return to the legislature in 2019 and seek a bill which removes the 2020 sunset, making the guest ranch provisions a permanent part of Oregon law. HB 4031 also contained an important amendment to help the owner of property in the Metolius River Basin make use of the Metolius TDO’s that he received from the Oregon legislature in 2009. The acronym TDO is short for “transferable development opportunity”. In 2009, the Oregon legislature designated the Metolius River Basin as an “area of critical statewide concern”. The result of this designation was a significant restriction on two property owners who wished to site destinations resorts in the basin. In order to provide a small amount of equity to the two property owners whose developments were regulated out of existence, the legislature provided each owner with a TDO to allow that owner the ability to transfer the development rights from the Metolius Basin to another area in the state. The goal of the TDO’s was to allow the TDO holder to work with a willing property owner outside of the Metolius region to plan and develop the property. The legislation made siting easier, enabling the TDO holder to develop in places where development would otherwise be prohibited by state and local law. Unfortunately, the legislature’s TDO bill was not well drafted or thought out, and has required multiple amendments since it was first approved in 2009. HB 4031 made more amendments to the original TDO bill, and hopefully the last set. The property owner has identified property in a coastal county for the siting of the resort and use of the TDO’s, and the latest changes should make that development finally possible. OIA worked closely with Rep. Clem on this portion of HB 4031 as well, and the bill was approved and signed by Governor Brown. The long session beginning in February, 2019 is the next opportunity to make changes to Oregon land use law. OIA is already working on legislation for the 2019 session, where land use bills will take a much more prominent position in the list of legislative “to do’s”.